We worked with Brittany Chonka, one of our student interns, over the last two semesters helping her develop her physical and her virtual collections. 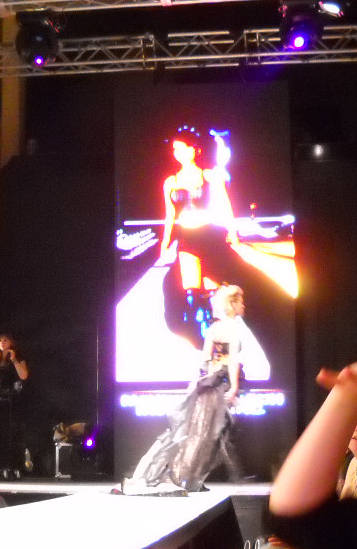 All of this effort culminated at Runway 3.0, with hercollection shown on both the physical catwalk with her avatar models walking the big screen behind her live models. After Missy’s demi-collection, which was shown earlier in the event, Britt’s collection closed the group of senior collections with her collection of six pieces. Britt used an array of materials, including lace, leather, taffeta, suede, fur, and fiberoptics. Inspired by the steampunk and neo-Victorian trends, Brittany’s work incorporated special buckles as her closeures and had a decidedly theatrical feel. 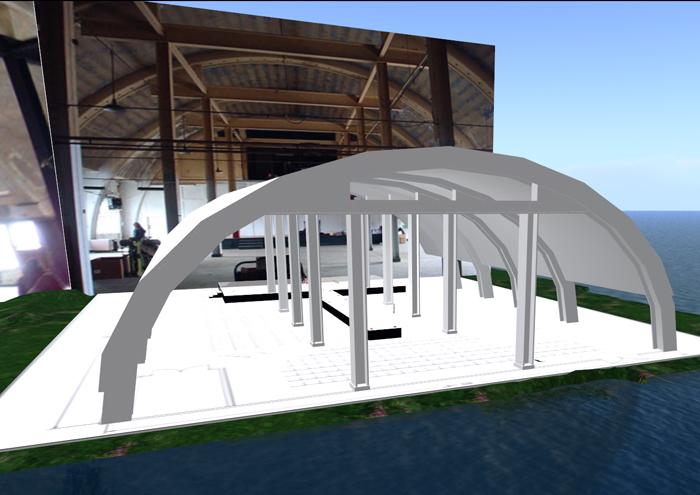 Britt’s work is shown here, both on the physical Runway 3.0 catwalk and on the Virtual Runway™ catwalk. 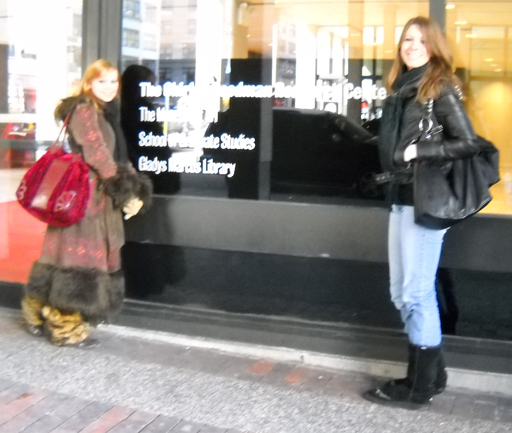 The Fashion Research Institute interns from Buffalo State University, Missy & Britt, rounded out their visit on day four. After a long day in the City the previous day, everyone was a little hard to rouse. 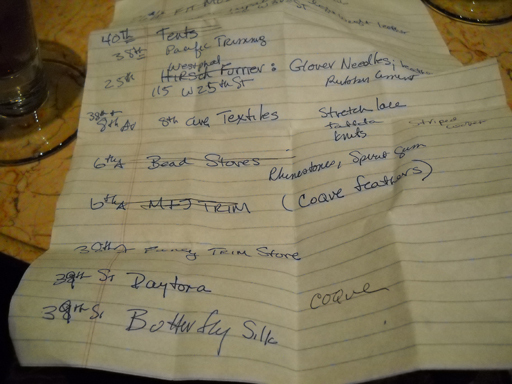 We put some mileage in, criss-crossing the rag district and searching out the last nuanced trim and detail for their collections. Packing up, we managed to get everyone into the car and to the train station with 15 minutes to spare – only to discover that the train was running 20 minutes late. Hosting our interns was a delight. We were very pleased to meet these two charming young women in person. We are looking forward to their Spring break, when they will return for help with their final run-up to turning in their collection. Our interns had the opportunity to learn first hand about New York, the fashion capital of the world and about how the apparel industry works;. We had a chance to make sure they located everything they needed for their collections; and they had in-depth tutoring on developing their portfolio for future endeavors. 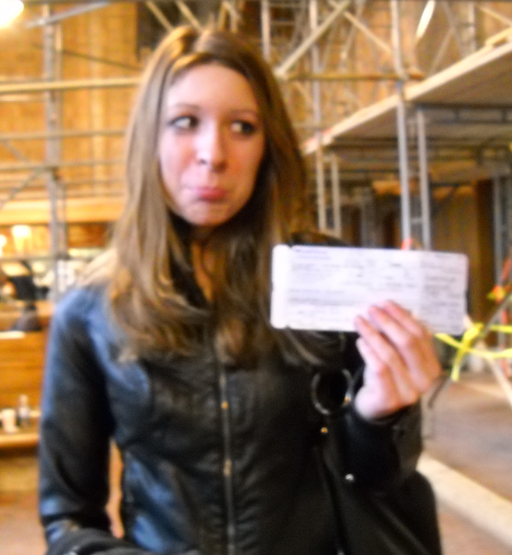 It was a great trip, and we were very sorry to wave good-bye at the train station. Of course, now the fun (or hard) part begins: constructing the garments for the two versions of Runway 3.0 and developing the visual story for their portfolios. Britt and Missy will be back in six weeks for their Spring Break, where we’ll help with the technical design of their collections. 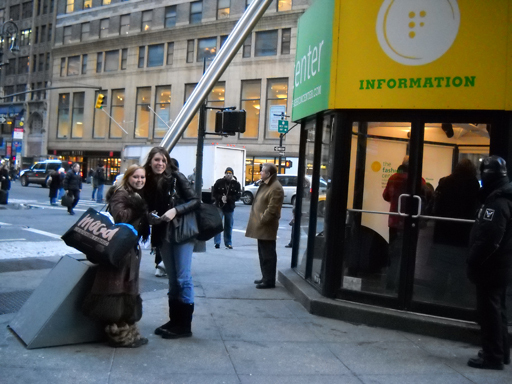 FRI Student Interns Take Manhattan: Day Three! Since the FRI interns had a long and grueling day the previous day, we got a later start on Friday. No one seemed to be in a big hurry to finish up breakfast, served in the sun-drenched family room (a definite advantage in wintery New York). Nevertheless, we finally got ourselves loaded into the car for our hour-long drive into the City. The trip flew past as we talked the whole way about fashion and careers, interrupted occasionally to point out areas of interest. As we crossed into Manhattan over the Harlem River, Britt and Missy became quite excited. 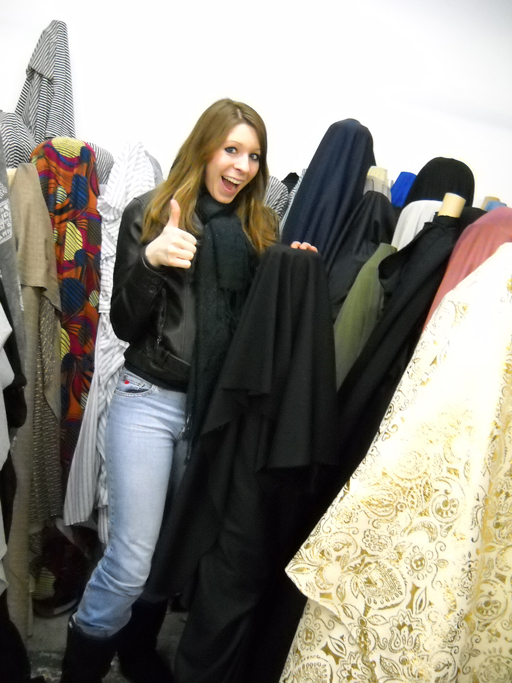 Mecca for fashion designers was at our fingertips! Dropping the car at a convenient lot, we started our long day of sourcing and more. 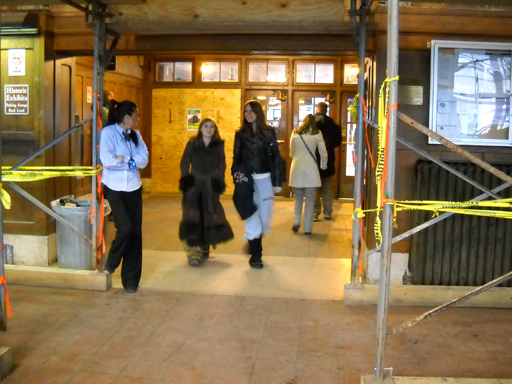 First we visited the FIT campus, which is a block-long street of school buildings. We dropped into the FIT Museum, which had three exhibits currently installed. We did a whirlwind tour and made sure to pick up all the exhibit brochures. Both interns found something to interest them in the American Beauty exhibit. Missy was thrilled about the evening wear; Britt was fascinated by the use of furs and leathers. Upstairs in the revolving exhibit space, both fell in love with the early fashions. Britt was particularly enamored of the late Victorian style clothing on display, while Missy found a length of Luminex fabric on display which captivated her. Departing FIT, we cut across on 29th Street and popped into a couple of the event planning/party stores to source some less common trims and textile substitutes. Often just knowing things are available will change a designer’s vision, so we were trying to expose the interns to as wide an array of products as possible. Heading up 6th Avenue, we took in the import district, with the wide array of costume jewelry, hair supply stores, and hosiery importers. As we crossed into Herald Square, we stopped for the ‘perfect’ shot of the Empire State building framed by the buildings on either side of 34th Street. then we tackled Macy’s. We didn’t have a lot of time, so we quickly walked the windows and then cut in through the main cosmetics floor and did a whirlwind visit of the “Aisles of Beauty” followed by a quick visit to the accessories, handbags, and watches. Both declined visiting the Louis-Vuitton boutique claiming it would be ‘dangerous to their wallets’. Heading back to 6th Avenue, we headed north to M&J Trimmings and the other bead and trim stores on 6th Avenue. Finished there, we walked up the Avenue to Bryant Park and the tents for Mercedes Benz New York Fashion Week. It was oddly quiet, with only a few ready wagons pulled in on 6th Avenue, and a remarkably small cluster of paparazzi and visitors. The usual gaggle of ‘models waiting to be discovered’ were very much not apparent and there was a decided lack of black cars dueling it out to deliver their passengers to the red carpet. We’re not sure if the lack of energy was due to the poor economy or simply because when a party is over in New York, it’s over, and every trendster knows it and refuses to get caught dead at a venue that’s outdated. Perhaps the fact that the party is moving uptown in the Fall contributed to the poor turnout; all we can say is that at 2 pm on a Friday afternoon on a relatively clement winter day, there weren’t even the usual park goers hanging out to ogle the passers-by. 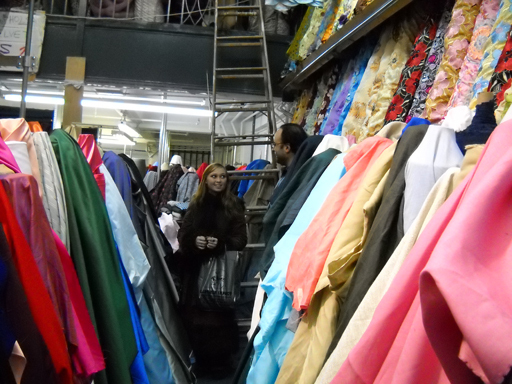 Departing the tents, we dove into the rag district for the real reason for the visit: sourcing! First stop was Leather Impact, where Brit found two skins with minor blemishes (both goatskins, one with a lovely soft golden metallic spray finish, the other a very soft 1 ounce sueded half skin) at the ‘perfect’ price, which of course made the skins ‘perfect’. 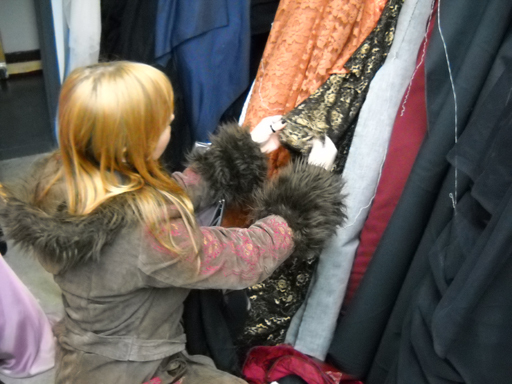 Heading around the corner to 39th Street, we went to the ‘Fabric Store of Enormous Rats’. There are many job lotters in the rag district, all of which seem to be named things like A&J, A&S, A&A, and so on. It’s a bit tough to differentiate them; however, the Store of Enormous Rats’ has earned this distinction by virtue of the fact that at one point a few years earlier, we were sourcing for a theatrical event and digging through the basement. We moved a bolt of fabric and a rat ran across our feet. Rats are semi-common in New York, but this one seemed a tad put out that his home had been moved. At any rate, the prices at the Store of Enormous Rats are really excellent and with only minor haggling everyone can usually walk away satisfied. Except, perhaps, the rats. In any event, the proprietor and staff got into the spirit of the hunt and were very helpful at moving bolts around for the ladies. We soon found Missy’s single knit jersey, which she negotiated a very good price for. Britt had a wider array of fabrics she was sourcing, but we soon found her changeable iridescent taffeta (black to silvery grey); her lace (better than expected); and silk crepe chiffon (it’s like buttah!). Successfully concluding Britt’s purchases, Missy was almost overwhelmed by the display of sequined fabrics by the counter, but we were able to carefully disengage the bolts from her fingers and head west to Daytona Trims. Daytona yielded up dye, inexpensive (ok, cheap!) zippers and buttons, strapping, and best of all, stretch rhinestone trim (three guesses who bought that?) Missy was dissuaded from purchasing all the other wide rhinestone trims by being reminded that developing her own beading patterns would let her put them in her portfolio. Tucking everything carefully away, we headed over to 7th Avenue for a glory shot by the Fashion District Information Center, home of the giant button and needle. Then we headed south on 7th Avenue (aka Fashion Avenue) for a quick bite at Seven on 7th to wait out rush hour. Heading out of the City and beating our way back through the traffic, we were well content with our day, even it was remarkably rat-free. Missy and Britt had gotten their full suite of fabrics for their collections, as well as additional trims; we had taken in some exhibits, paid our respects to the Tents at Bryant Park, we’d had the ‘chi-chi NYC restaurant’ experience, and we had a chance to experience Rush Hour in New York. Back home, we found a fire and martinis waiting for us, as well as some light snacks. A perfect ending to a perfect sourcing day in New York. "You Aren't Supposed to Rip....It. Oh." "This is the PERFECT Taffeta"
Perfect Fabric! Perfect Price! Yes, She Wants It! Our Avatar Apparel Design 101 course has been approved by Buffalo State University and will be offered for university credit the first time in June 2010 as FTT495 VIRTUAL FASHING. The course is a 3 credit course taught during the Summer 2010 term and starts June 1 and runs till June 26. Students register as non-matriculated students through Buffalo State University. The credit they receive for this course may be transferred to other universities. We will use our text book, Designing Dreams Ed. 2, which will be available on Amazon in April. 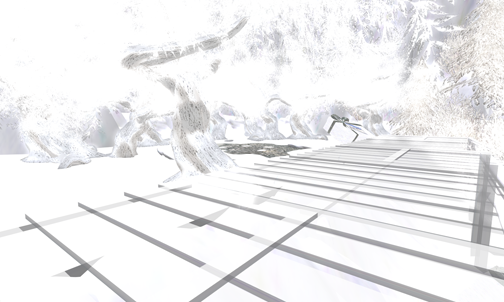 We will meet virtually in our regions in ScienceSim. This is an accelerated course which meets daily for the full three week period. Students are responsible for their own hardware and Internet access. Students must also have a Skype account. This is a fast-paced course which will take a beginning student through the process of avatar apparel design and merchandising. Students should have good working Photoshop skills and know how to work with layers, brushes, styles, and effects. Students will complete the course with a runway show of their work. Students will be taught to develop avatar apparel using the patent-pending Black Dress Design development methodology. Buffalo State University was founded in 1871 and has been part of the State University of New York educational system since 1948. It is accredited by the Middle States Association of Colleges and Schools as well as various other accrediting institutions for selected programs. For more information about registration, including a list of fees and tuition charges, please visit the Registrar’s page at the Buffalo State University web site. For more specific information about FTT495, please visit the Summer 2010 schedule listing. 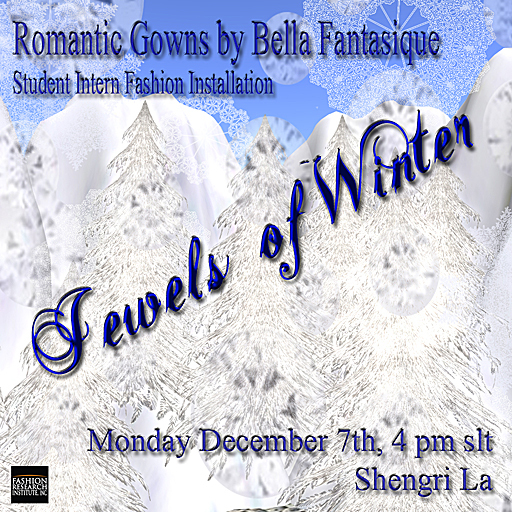 Please join Fashion Research Institute student intern Missy Lavecchia at her first solo fashion installation for her fashion label, Bella Fantasique. Missy is a senior at Buffalo State University who is working on her internship in avatar apparel with Fashion Research Institute. Missy has been working hard at developing her most recent collection of romantic gowns, which will be featured on Monday, December 7th at 7 pm ET in the Fashion Research Institute Second Life Shengri La Hope region. To attend this event, please follow this link.